CESI is proud to present the following observation: Nexam has delivered two (speciality) compounds to Victrex (4-fluorophenylethynylbenzophenone (4-FPEB) and 3-fluorophenylethynylbenzophenone (3-FPEB) and Victrex has subsequently filed a patent application WO 2015087059 A1 (published June 18, 2015). Due to additional information presented below in this blog post, CESI believes Victrex end cappers might indicate substantial (near) future business. Why? In this blog post the author aims to answer this question. “For more than three decades, Victrex has collaborated with customers to help turn their toughest challenges into tangible benefits. As a product leadership company, our proactive approach in monitoring the trends of the industries we serve and engaging in open dialogue with industry leaders enables us to deliver what is required to maximise performance today and tomorrow. “Polyaryletherketones (PAEK) has a continuous operating temperature of 250 °C (482 °F) and under short-term loads can function up to 350 °C (662 °F). When burned it has the least toxic and corrosive fumes. It also has a low heat output when burned, so it qualifies for use in interior aviation applications. It also has good overall chemical resistance. “Mechanical properties of moulded samples were assessed and compared to commercially available PEEK 90, PEEK 150 and PEEK 450 materials. Results are provided in Table 6. Table 6 It will be appreciated from Table 6, that moulding the example 9 polymer having the same starting RV as PEEK 90, yields a polymer with properties more like PEEK 150. Similarly, Example 1 1 , having the same starting RV as PEEK 150, has properties after moulding which are more like PEEK 450. Advantageously, it is found that the shear heating and injection moulding process promotes the majority of the curing of the polymers and thus an increase in RV and improved properties. A post-cure step (e.g. heating at 400°C for 2 hours) is not found to lead to a significant further increase in fracture toughness over “as moulded” samples. CLICK PICTURE TO ENLARGE CESI SCHEME 1! CLICK PICTURE TO ENLARGE CESI SCHEME 2! Even more interestingly, Nexam has in fact rigorously protected PAEK in respect to intellectual property (IP)! “ It has now unexpectedly been found that cross-linkable aromatic polyetherketones may be obtained by incorporation of acetylenic residues comprising carbon-carbon triple bonds, for instance as endcapping residue(s) [CESI: the Victrex application…], as pendant residue(s) along the molecular backbone and/or as residue(s), wherein the carbon-carbon triple bond(s) is part of the polymer chain, in aromatic polyetherketones. 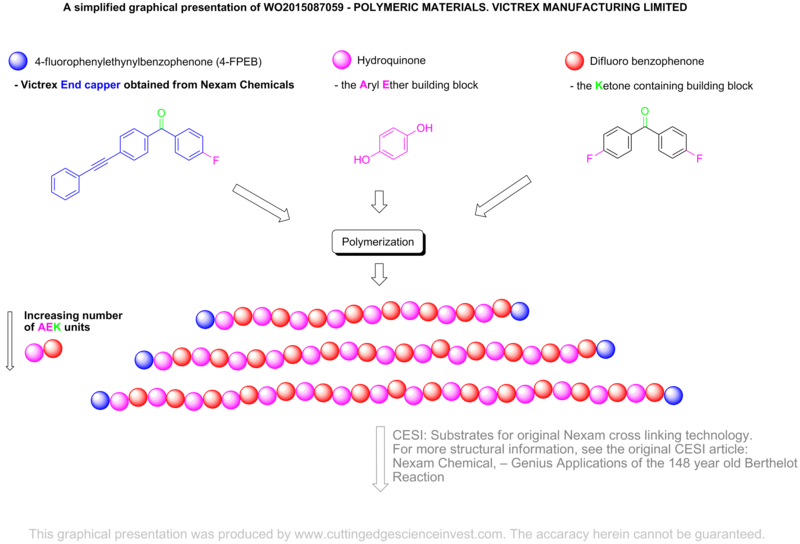 The carbon-carbon triple bond allows for cross-linking, such as acetylenic cross-linking, of the cross-linkable aromatic polyetherketone, as alternative and/or additional cross-linking mechanism, thus implying that improved and/or changed properties, such as changed E-module value, changed impact strength and improved resistance towards thermo-oxidative, thermal, oxidative and/or mechanical degradation may be achieved. Also the Tg may be affected by such cross-linking. The acetylenic residues were found to be compatible with normal thermoplastic processing methods. 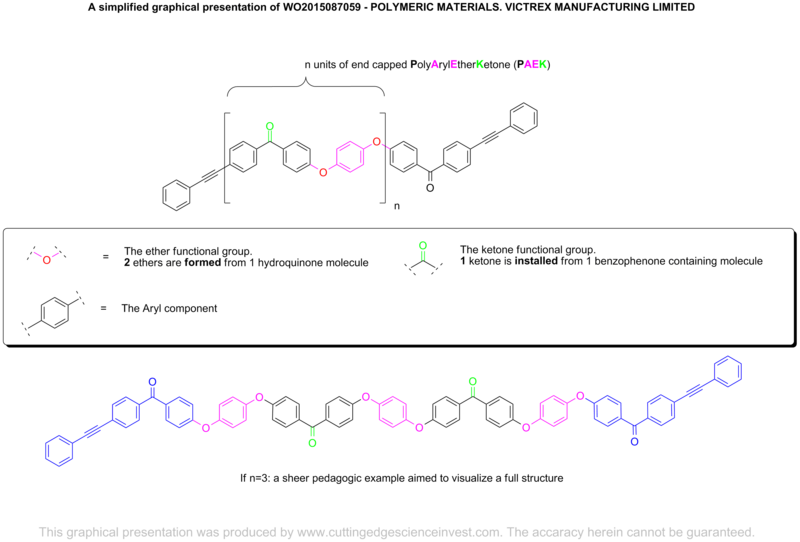 Thus, cross-linkable aromatic polyetherketones may be processed using normal thermoplastic processing methods, before cross-linking is initiated. Further, a by-product free (contamination free) material may be obtained. In addition, the Tg (glass transition temperature) may be increased to such a level that the cross-linked polymer may be used in high temperature applications without traditional thermoplastic drawbacks jeopardizing the application performance. Furthermore, the cross-linking enhances the already good wear resistance of PAEK. Thus, for cross-linkable aromatic polyetherketone may be used in primary structures in aerospace applications were extraordinary level of thermal resistance is required. Further, cross-linked aromatic polyetherketone may replace polyimides in high temperature applications, such as in airplanes, aerospace and other structural applications were good temperature and creep properties are required. In CESI´s opinion, the Nexam case has never been stronger. Are you ready for Market? We are looking for new polymers to work with and want to convert a Fiber plant to a polymer plant. Excellent info Christer! Thousands of thank you. Yes, I believe 😉 CESI is currently in Cambridge (UK) and very bizzy until Friday. After Friday, I will look into this more (if additional information is available). Thanks again!